It is common that Steel Stainless Rapid Prototype and Aluminum Rapid Prototype are used widely among all the Metal Rapid Prototypes. Except that, Brass Rapid Prototype are also used frequently. Generally speaking, if you want to make prototype in Golden color , it is a good choice to make it with Copper/Brass, because of its own color and properties, you can save the process cost of painting and make your prototype looks luxury and upscale. In two weeks ago, a new client found our company via internet and asked whether we could design and make a luxury base of Buddha statue. His case was below: he bought a luxury and upscale Buddha, but couldn’t find a fit base to locate it. So he wanted to find a substantial prototype manufacture through internet to customize a good prototype to set his Buddha statue on it. Because the client hadn’t designed the 3d drawing before he found us, so he required us to do it and agreed to pay the extra design fee. We needed to know some specific sizes of Buddha so that we could make the fit base of Buddha prototype for him before designing. After he posted the Buddha to us, we began to measure and finished the design within two days. After he confirmed it, we proceeded to make the vowin.cn/' target='_blank'>rapid prototype without delay. The Brass base of Buddha statue were involved in three process which containing CNC machining, Polishing and Sand Blasting. CNC machining: CNC machines move as a certain path under the instruction of program, cutting off the spare parts of material to obtain the rudiment of prototype. 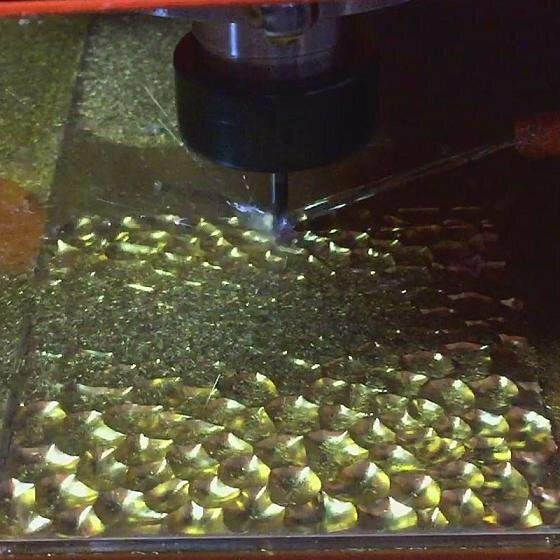 Polishing: there are some burrs and rough marks on the prototype surface after CNC machined, it needs to be hand-deburred by sandpaper to get the smooth surface. Sand Blasting: spraying a layer of particular sands on the surface of prototype to reduce its roughness. The client was very satisfied upon received the base of Buddha prototype we made for him. he said if his friends around him need to make prototype, he will strongly recommend us to them.